The S.E.5a (for Scout-Experimental) was built at the Royal Aircraft Factory and was the first successful design by W.E.W. “Tony” Petter, who would later design the Gloster Gladiator, the Meteor, the English-Electric Canberra and the Folland Gnat. Appearing in 1917, right after “Bloody April,” as the S.E.5 with an unreliable 150 h.p. Hispano engine, the airplane was seriously underpowered. Modified with the 200 h.p. Hispano in May 1917 as the S.E.5a, the airplane was built by the Royal Aircraft Factory, Austin, Vickers, and Martinsyde. The Hispano was still unreliable, and only 800 S.E.5as were delivered during the rest of 1917. Wolseley modified the Hispano-Suiza 8A into an engine known as the Viper. Speed was increased by 7 mph and climb was increased. This became the 1918 production standard, and by that summer the RAF had 25 squadrons equipped with the S.E.5a. Where the Camel was tricky and dangerous with its rotary engine, the S.E.5a was rock-solid with its V-8. If a comparison can be made, the Camel was the “Spitfire” to the S.E.5a’s “Hurricane.” The S.E.5a bore the brunt of air combat during the last six months of the war, and was the mount of aces such as Anthony Beauchamp-Proctor, a South African flying with 54 Squadron who scored many of his 54 victories with an S.E.5a and Edward “Mick” Mannock, the Commonwealth Ace of Aces with 73 victories, the majority of them scored in the S.E.5a. Billy Bishop also flew it as C.O. of 85 squadron as did James McCudden of 56 Squadron. 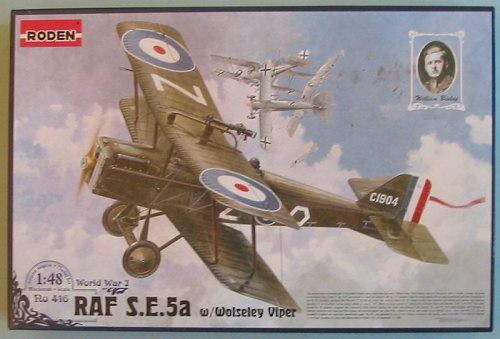 Famed aviation writer Cecil Lewis, author of “Sagittarius Rising” - one of the best books on World War I combat - flew the S.E.5a at night with 54 Squadron on Home Defense. While the S.E.5a rapidly left RAF service after the war, a version with the 180 h.p. Hispano was the main equipment of the U.S. Army Air Service until the mid-1920s. 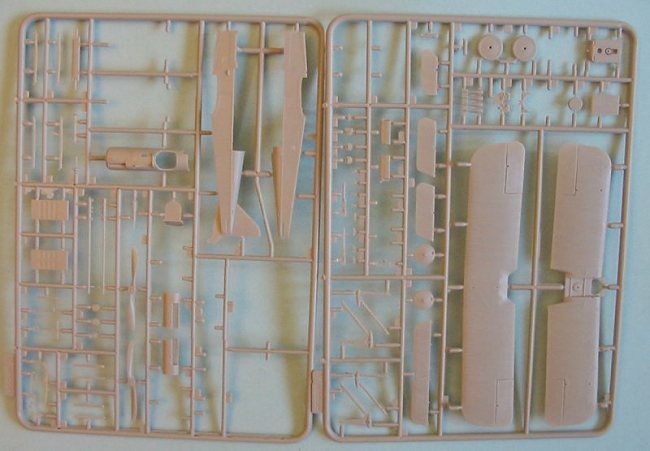 There have been four S.E.5a’s (ostensibly) released in 1/48, the first being a kit by Aurora in the 1950s that was later redone and released by Monogram in 1970s, one by Lindberg that was actually an S.E.5 from the 1960s, and one by Blue Max in 1999. Of these, the only one that was really an accurate model of the S.E.5a was the Blue Max limited run kit, which suffered from the “dread wing ripple”. This new kit from Roden effectively makes all of the abo ve kits obsolete. At under $20 retail, it is well-designed, with superb surface detail, and looks to be dead-on accurate in shape. From what is on the sprues, this looks like it will make up as nicely as the Eduard Camel. Decals are provided for the S.E.5as flown by Anthony Beauchamp-Proctor, Mick Mannock and Billy Bishop. This is a more complicated model than the Eduard Camel, if only on the grounds that the rigging is more complicated. That said, it looks easy to build with a logical parts breakdown, and would be a good model for a World War I modeler who has done the Roden Nieuport 28.